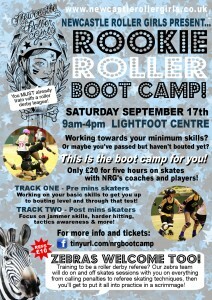 Newcastle Roller Girls are pleased to announce their first ever bootcamp on Saturday September 17. This bootcamp is aimed at skaters in their first flush of derby love. If you’re yet to pass your minimums or are passed your minimums but yet to bout, this is the bootcamp for you! 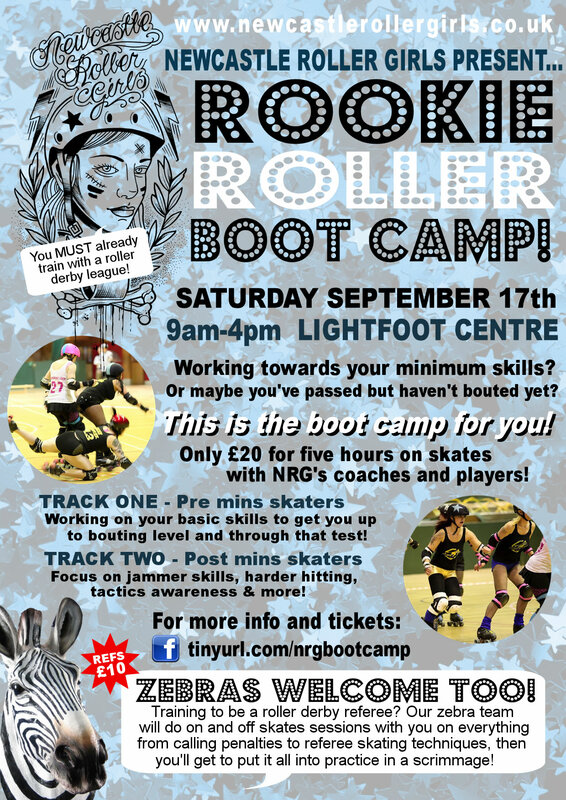 There will be two tracks and five hours of on-skates sessions, all coached by Newcastle Roller Girls coaches and bouting skaters. Track One: Pre-minimums skaters. Work on those basic derby skills you need to pass your minimums. Expect drills on perfecting derby stance, nailing your stops, falls, shoulder and hip checks, jumps and whips. Track Two: Post-minimums up to two bouts experience: More advanced drills to get you bout perfect. Expect tactics, walls and wall breaking, jamming skills, harder hits, perfecting your stride and more. In the final session of the day put your new skills into practice with a mixed scrimmage. Refs: Zebras are more than welcome to join in the fun. We will be running on and off-skates sessions covering everything from how to assess penalties to how to skate like a ref, before you ref the mixed scrim in the final hour. Once the skating is over we’ve booked our after-bout party venue Mr Lynch for some well-deserved post bootcamp beers! Tickets are £20 per skater, £10 per ref. Event runs 9am to 4.30pm (registration 9-9.40am, first session starts 9.45am). Numbers are strictly limited, so there’s plenty of track time and space for everyone! Any questions, add yourself to our facebook event and get in touch. Venue: Lightfoot Centre, Warrier Street, Newcastle, NE6 3BR. * Food options at the venue are very limited, though there are supermarkets within driving distance. Bring a packed lunch for ease. ** Post-mins skaters bring a black and white tee with names and numbers for the scrim.. SORRY – PRE MINS TICKETS NOW SOLD OUT! Sorry, this event is pre-book only – no ticket sales on the door.